We've been compiling the best Porsche models on eBay for almost two years now, and we've seen some pretty astonishing cars pop up now and again. In all that time, we've published these every other week. Well, enough of you have spoken up that we're going to try a weekly format, with two of us picking selections, so check back often. This week, we're looking at some higher mileage examples that still look to be fantastic examples of the marque. These include a time capsule '86 Carrera Cabriolet, a buy it just for the color Riviera Blue 993, a Mocha Brown 911 SC, a 914 that "looks good from 10 feet" and a Boxster that could turn out to be the bargain of the summer. Some of these cars could be great collection investments, while others might prove to do more financial harm than good. There's just something about that blue and caramel color combination that pulls on my heart strings. Maybe it's because we have a similar car in our own driveway, or maybe it's just because I'm so tired of all the silver and black Boxsters I see. 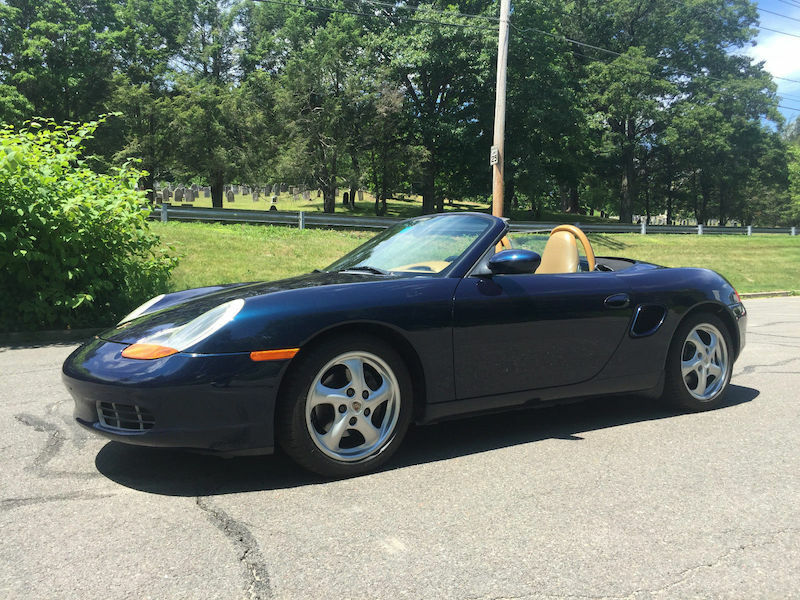 Either way, this early Boxster is an interesting example at an extremely aggressive price point. With no reserve and a current high bid of $5,200, someone could potentially be getting quite a bargain, here. Yes it's a tiptronic, but if the car checks out during a PPI and it can be had for under $7k, I would think long and hard to determine if rowing my own gears was that important. We'll be keeping a close eye on this Boxster to see what it ultimately sells for. I'm not sure calling my car a "10 footer" is how I would want to start off the description of my advertisement, but at least you know the seller's honest. More importantly, it's an accurate description of this 1.7 liter 914 currently for sale on eBay. It's not quite clear what went wrong in the re-paint process, but there is some serious cracking going on with the paint or the clear coat. Paint issues aside, this little 914 looks to otherwise be rock solid and a great driver's car. Said to have undergone a "ground up" restoration and need nothing (other than paint that is), the pictures show a fairly clean 914 with good body panels and no real visible rust to speak of. "Lightweight" might be a bit of a stretch here, but this SC does appear to have been ordered with weight savings in mind. According to the seller's listing it came from the factory with no sunroof, only one (1) side mirror, no A/C, manual sports seats, no fog lights and later had the rear spoiler swapped out. Equipped with the numbers matching 3.0 liter engine, this SC is painted in very desirable Mocha Brown with a Cork and plaid tartan interior. While the miles are a bit high at 112k, it should be good for at least another 100k given the claimed work and maintenance that's been performed. Definitely a candidate for someone looking to have both a driver and a nice DE/track candidate. I was sold at Riviera Blue. There's just something about this particular color that looks so right on a 993. While I would prefer to see the interior in Cashmere, the Dark Blue of this 993 looks quite nice with no noticeable tears or cracks. While minimally optioned, the original buyer did opt for the 18" Turbo Twists and that always practical rear wiper. 23 bids have been placed running the price to $50,000 with the reserve not yet met. AT 87k+ miles, it will be interesting to see how high the bidding goes and at what price the seller is willing to let this colorful example go at. 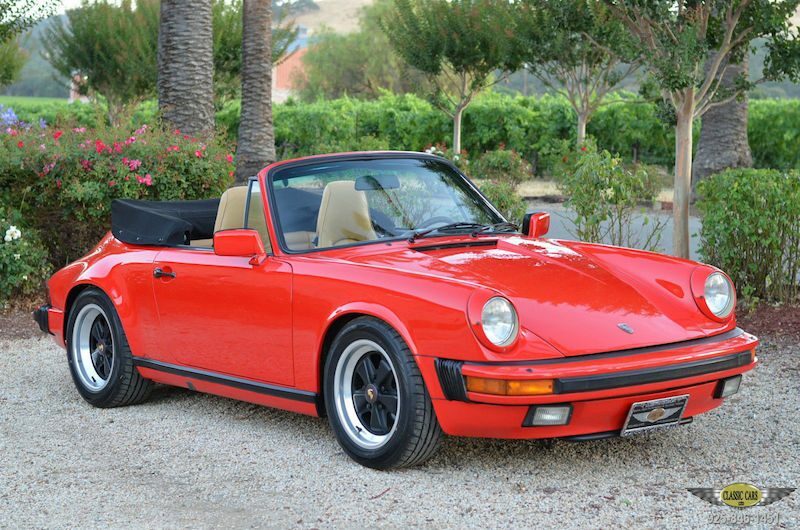 For a 30-year old 911 with 114k miles on it, this '86 Carrera Cabriolet looks like a time capsule. Said to be all original, both cosmetically and mechanically, this two owner Cab has spent its entire life in Northern California and it shows. Very well optioned, our only nit pick would be the addition of the aftermarket speakers to the door panels. Other than that, this 911 is a stunner.